I’ve never asked for charity money on Facebook, but if there was ever a reason to do so, this is it. In less than two weeks, a team of people is going to attempt a feat that’s never been done before. 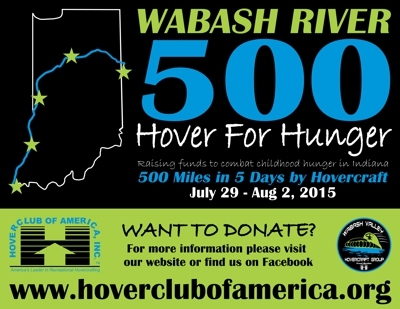 We’re going to attempt to travel the entire 500 mile length of the Wabash river, from start to finish, by hovercraft. We’re doing this for the best cause imaginable; feeding hungry kids who don’t get enough at home. This isn’t some big mega charity where half of your money goes to overhead or executive salaries. This is a small group of people who, without any recognition for doing so, pack bags of healthy groceries for less fortunate school kids to take home with them each Friday. Without these fine people, those kids would otherwise be hungry until they got back to school for breakfast Monday morning. Yes, this happens in our country, and it’s sadly not that uncommon. We’re trying to get sponsorships of 5 cents per mile, or $25 if we make the whole 500 miles. 100% of the proceeds go directly to buying food for these kids. Whether you want to donate $1 or $1000, it all goes to food and will be appreciated by a hungry kid. Donating is easy, just click the link below. You can read about the trip if you want, or just click the donate button on that page. You can also do it anonymously if you prefer. We’re all doing our own specific charity, so if you want it to go to mine, type “Hoverstream” in the comments box, otherwise leave it blank and we’ll split it up.